Nothing works better than two ingredients that were meant to be together. Echinacea is a popular herb and has a long history of traditional use. Vitamin C promotes antioxidant protection and is one of the leading vitamins for immune support. 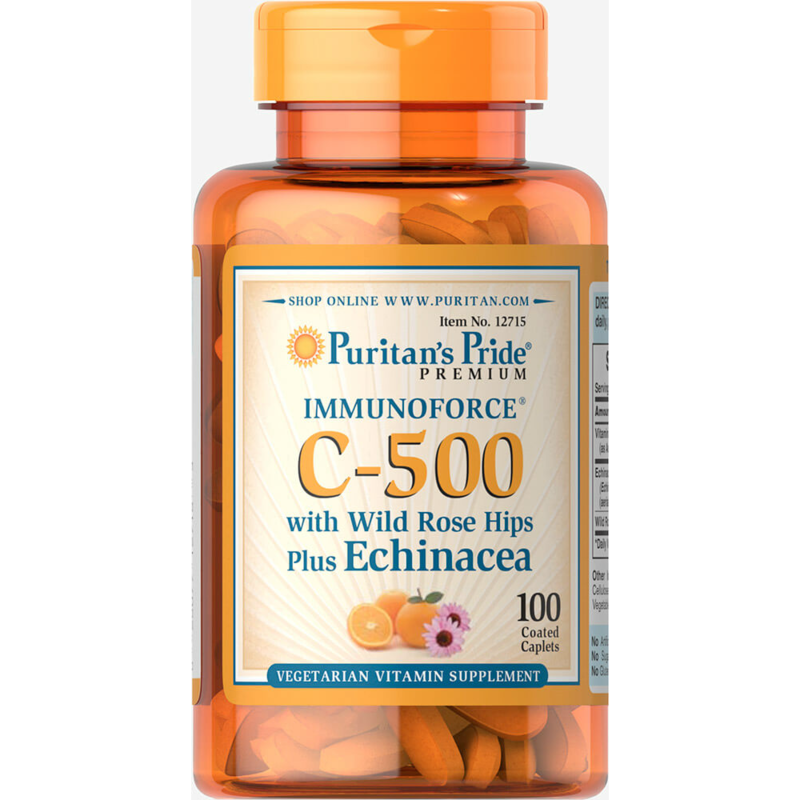 Vitamin C with Rose Hips and Echinacea works to promote a healthy immune system throughout the year and is especially good during times of seasonal change. Most experts recommend getting vitamin C from a diet high in fruits and vegetables rather than taking supplements. Fresh-squeezed orange juice or fresh-frozen concentrate are good sources. Historically, vitamin C was used for preventing and treating scurvy. These days, vitamin C is used most often for preventing and treating the common cold. Some people use it for other infections including gum disease, acne and other skin conditions, bronchitis, human immunodeficiency virus (HIV) disease, stomach ulcers caused by bacteria called Helicobacter pylori, tuberculosis, dysentery (an infection of the lower intestine), and skin infections that produce boils (furunculosis). It is also used for infections or inflammation of the bladder and prostate, nerve pain, and complications during pregnancy. Other uses include increasing the absorption of iron from foods. Vitamin C is also used in combination with a drug called deferoxamine to increase removal of iron from the blood. Some people use vitamin C to correct a protein imbalance in certain newborns (tyrosinemia). It is also used to prevent the transfer of HIV from mothers to babies during breastfeeding. 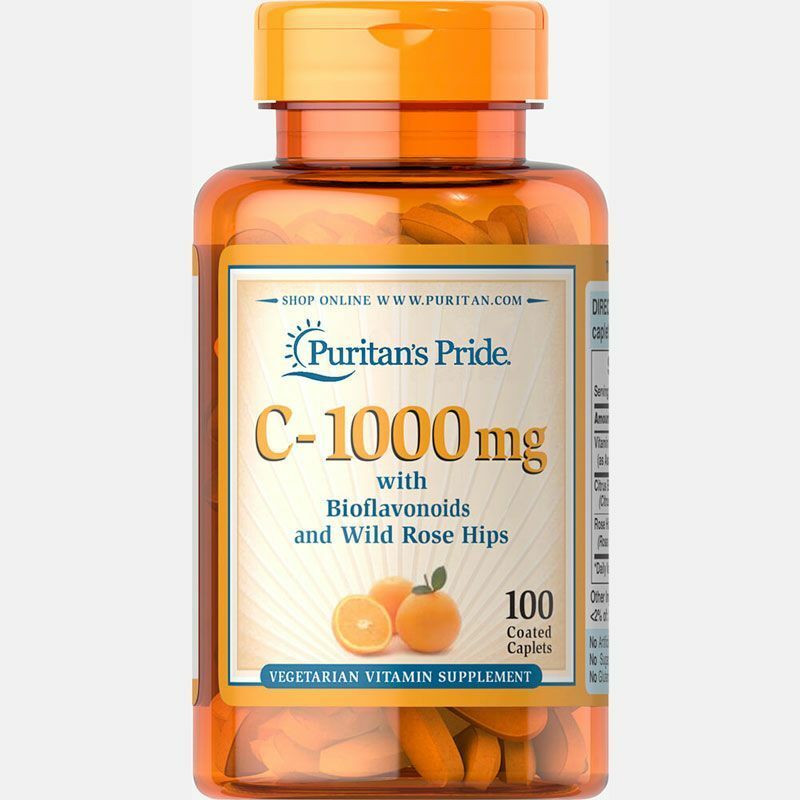 Vitamin C is also used to help reduce the side effects of bowel preparation. There is some thought that vitamin C might help the heart and blood vessels. It is used for heart disease, hardening of the arteries, preventing clots in veins and arteries, heart attack, stroke, high blood pressure, high cholesterol, irregular heartbeat after surgery, inadequate blood flow that causes blood to pool in the legs, and to help medications used for chest pain to work longer. It is also thought that vitamin C may increase the healing of burns, ulcers, fractures, and other wounds. Vitamin C is also used to prevent long-term pain after surgery or injury. Vitamin C deficiency: Taking vitamin C by mouth or injecting as a shot prevents and treats vitamin C deficiency, including scurvy. Also, taking vitamin C can reverse problems associated with scurvy. Iron absorption: Administering vitamin C along with iron can increase how much iron the body absorbs in adults and children. A genetic disorder in newborns called tyrosinemia: Taking vitamin C by mouth or as a shot improves a genetic disorder in newborns in which blood levels of the amino acid tyrosine are too high. Age-related vision loss (age-related macular degeneration; AMD):Taking vitamin C, vitamin E, beta-carotene, and zinc helps prevent AMD from becoming worse in people at high risk for developing advanced AMD. Reducing protein in the urine (albuminuria). Taking vitamin C plus vitamin E can reduce protein in the urine in people with diabetes. Irregular heartbeat (atrial fibrillation): Taking vitamin C before and for a few days after heart surgery helps prevent irregular heartbeat after heart surgery. For emptying the colon before a colonoscopy: Before a person undergoes a colonoscopy, the person must make sure that their colon is empty. This emptying is called bowel preparation. Some bowel preparation involves drinking 4 liters of medicated fluid. If vitamin C is included in the medicated fluid, the person only needs to drink 2 liters. This makes people more likely to follow through with the emptying procedure. Also fewer side effects occur. A specific medicated fluid containing vitamin C (MoviPrep, Salix Parmaceuticals, Inc.) has been approved by the U.S. Food and Drug Administration (FDA) for bowel preparation. Common cold: Most research shows that taking 1-3 grams of vitamin C might shorten the course of the cold by 1 to 1.5 days. A chronic pain condition called complex regional pain syndrome: Taking vitamin C after surgery or injury to the arm or leg seems to prevent complex regional pain syndrome from developing. Redness (erythema) after cosmetic skin procedures: Using a skin cream containing vitamin C might decrease skin redness following laser resurfacing for scar and wrinkle removal. Upper airway infections caused by heavy exercise: Using vitamin C before heavy physical exercise, such as a marathon, might prevent upper airway infections that can occur after heavy exercise. Stomach inflammation (gastritis): Some medicine used to treat H. pylori infection can worsen stomach inflammation. Taking vitamin C along with one of these medicines called omeprazole might decrease this side effect. Gout. Higher intake of vitamin C from the diet is linked to a lower risk of gout in men. Abnormal breakdown of red blood cells (hemolytic anemia): Taking vitamin C supplements might help manage anemia in people undergoing dialysis. High blood pressure. Taking vitamin C along with medicine to lower blood pressure helps lower systolic blood pressure (the top number in a blood pressure reading). But it does not seem to lower diastolic pressure (the bottom number). Taking vitamin C does not seem to lower blood pressure when taken without medicine to lower blood pressure. High cholesterol: Taking vitamin C might reduce low-density lipoprotein (LDL or "bad") cholesterol in people with high cholesterol. Lead poisoning: Consuming vitamin C in the diet seems to lower blood levels of lead. Helping medicines used for chest pain work longer: In some people who take medicines for chest pain, the body develops tolerance and the medicines stop working as well. Taking vitamin C seems to help these medicines, such as nitroglycerine, work for longer. Osteoarthritis: Taking vitamin C from dietary sources or from calcium ascorbate supplements seems to prevent cartilage loss and worsening of symptoms in people with osteoarthritis. Sunburn: Taking vitamin C by mouth or applying it to the skin along with vitamin E might prevent sunburn. But taking vitamin C alone does not prevent sunburn. Wrinkled skin: Skin creams containing vitamin C seem to improve the appearance of wrinkled skin. Alzheimer's disease: Higher intake of vitamin C from food is linked with a reduced risk of Alzheimer's disease. Autism: Early research shows that taking vitamin C might reduce the severity of autism symptoms in children. Breast cancer: It's too soon to know if higher intake of vitamin C from food helps prevent breast cancer from developing. But a higher intake of vitamin C from food seems to be linked with a reduced risk of death in people diagnosed with breast cancer. Also, taking vitamin C supplements after being diagnosed with breast cancer seems to help reduce the risk of dying from breast cancer. Cataracts: Higher intake of vitamin C from food is linked with a lower risk of developing cataracts. 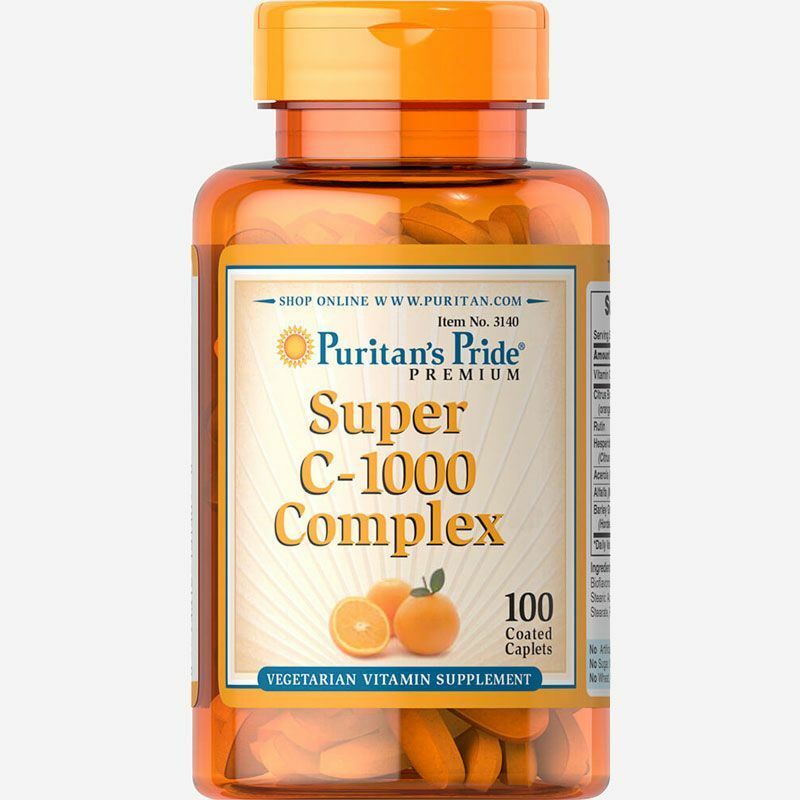 Some early research shows that people who take supplements containing vitamin C for at least 10 years have a lower risk of developing cataracts. But taking supplements containing vitamin C for less time doesn't seem to help. Cervical cancer: Some early research suggests that taking vitamin C reduces the risk of cervical cancer. Side effects caused by chemotherapy: Early research suggests that higher intake of vitamin C from food is linked with fewer chemotherapy side effects in children being treated for leukemia. Damage to the colon due to radiation exposure (chronic radiation proctitis): Early research suggests that taking vitamin C plus vitamin E might improve some symptoms of chronic radiation proctitis. Diabetes: Taking vitamin C supplements might improve blood sugar control in people with diabetes. Hearing loss: Early research shows that vitamin C may improve hearing in people with sudden hearing loss when used with steroid therapy. Infertility: There is early evidence that women with certain fertility problems might benefit from taking vitamin C daily. Mouth cancer: Higher intake of vitamin C from food is linked with a lower risk of mouth cancer. Pneumonia: Some research suggests that vitamin C might reduce the risk of pneumonia, as well as the duration of pneumonia once it develops. This effect seems greatest in those with low vitamin C levels before treatment. Bacterial infection in the nervous system (tetanus): Taking vitamin C along with conventional treatment appears to reduce the risk of death in children with tetanus. Stroke: Higher intake of vitamin C from food seems to be linked with a reduced risk of stroke. Complications during pregnancy: Taking vitamin C alone during pregnancy might help prevent the amniotic sac from breaking before labor begins. But taking vitamin C with other supplements doesn’t seem to help. Also, taking vitamin C, alone or with other supplements, does not prevent many other pregnancy complications including preterm birth, miscarriage, stillbirth, and others. Weight loss surgery: Weight loss surgery can cause the body to absorb more oxalate from food. This can increase the amount of oxalate in the urine. Too much oxalate in the urine can cause problems such as kidney stones. Vitamin C can also increase the amount of oxalate in the urine. Taking large amounts vitamin C after weight loss surgery might increase the risk of having too much oxalate in the urine. Kidney disease: Vitamin C can increase the amount of oxalate in the urine. Too much oxalate in the urine can increase the risk of kidney failure in people with kidney disease. Aluminum is found in most antacids. Vitamin C can increase how much aluminum the body absorbs. But it isn't clear if this interaction is a big concern. Take vitamin C two hours before or four hours after antacids. Taking vitamin C, beta-carotene, selenium, and vitamin E together might decrease the effectiveness of some medications used for lowering cholesterol. It is not known if vitamin C alone decreases the effectiveness of some medications used for lowering cholesterol. Some medications used for lowering cholesterol include atorvastatin (Lipitor), fluvastatin (Lescol), lovastatin (Mevacor), and pravastatin (Pravachol). Be watchful with this combination! The body breaks down aspirin to get rid of it. Large amounts of vitamin C might decrease the breakdown of aspirin. Decreasing the breakdown of aspirin might increase the effects and side effects of aspirin. Do not take large amounts of vitamin C if you take large amounts of aspirin. Vitamin C might decrease how quickly the body gets rid of choline magnesium trisalicylate (Trilisate). But it is not clear if this interaction is a big concern. For emptying the colon before a colonoscopy: 2 liters of solution containing polyethylene glycol and vitamin C is used the evening prior to colonoscopy or as a split-dose taken on the evening prior to and the morning of colonoscopy. The most commonly studied product for this indication is MoviPrep (Norgine BV). For age-related vision loss (age-related macular degeneration; AMD): 500 mg of vitamin C, 400 IU of vitamin E, and 15 mg of beta-carotene, with or without 80 mg of zinc, per day for up to 10 years. For preventing a chronic pain condition called complex regional pain syndrome: 500 mg of vitamin C each day for 50 days starting right after the injury. For increased protein in the urine (albuminuria): 1250 mg of vitamin C with 680 IU of vitamin E per day for 4 weeks has been used. For irregular heartbeat (atrial fibrillation): 1-2 grams of vitamin C per day for 1-3 days before heart surgery followed by 1-2 grams in two divided doses daily for 4-5 days after heart surgery has been used. For upper airway infections caused by heavy exercise: 600 mg to 1 gram of vitamin C per day for 3-8 weeks before heavy exercise has been used. For stomach inflammation (gastritis). : 1200 mg of vitamin C daily along with omeprazole has been used. For abnormal breakdown of red blood cells (hemolytic anemia): 200-300 mg of vitamin C three times per week for 3-6 months has been used. For helping medicines used for chest pain work longer: 3-6 grams of vitamin C daily has been used. For high cholesterol: 500 mg vitamin C each day for at least 4 weeks. For irregular heartbeat (atrial fibrillation): 2 grams of vitamin C once or twice in the day before heart surgery followed by 1-2 grams daily for 4-5 days after heart surgery has been used. EN: For adults, take one (1) caplet daily, preferably with a meal. IT: Per gli adulti, assumere una (1) compressa al giorno, preferibilmente con un pasto. 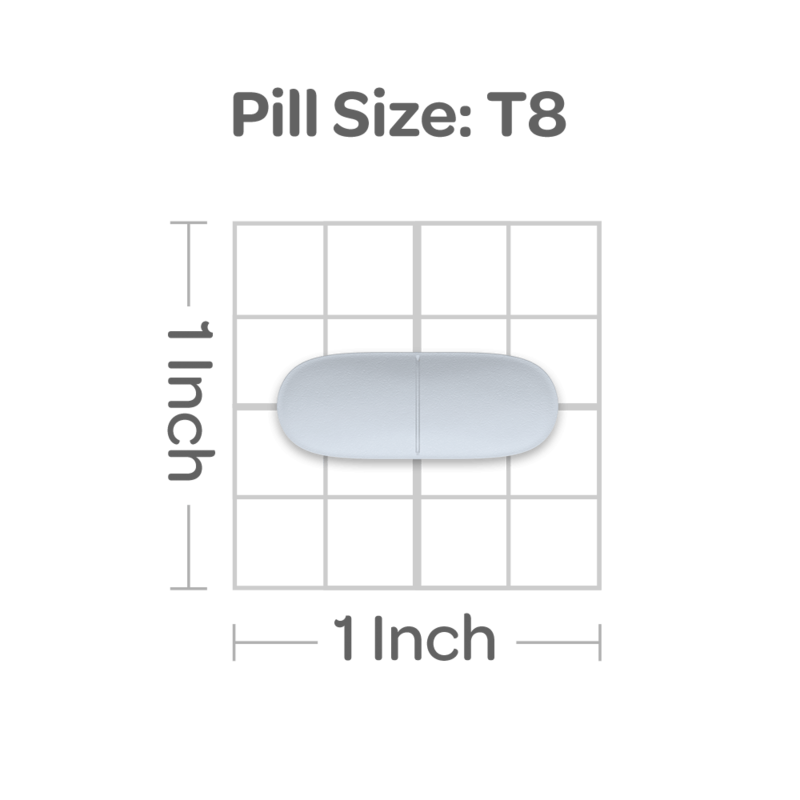 WARNING: If you are pregnant, nursing or taking any medications, consult your doctor before use. Avoid this product if you are allergic to sunflowers or daisy-like flowers. Discontinue use and consult your doctor if any adverse reactions occur. Not intended for use by persons under the age of 18. Keep out of reach of children. Store at room temperature. Do not use if seal under cap is broken or missing.